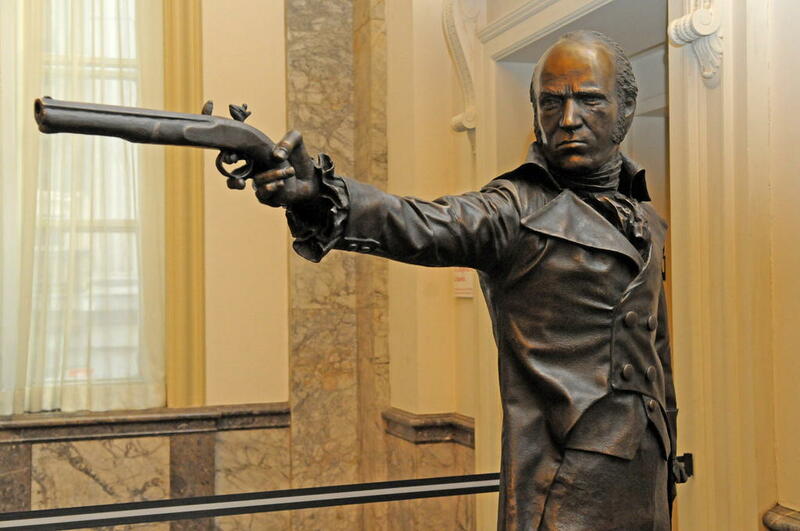 Aaron Burr, the last Vice President elected before the tenth amendment. Ever since the Vice President changed from being the President’s most popular opponent to the President’s partner—with the passing of the twelfth amendment in 1804—the Vice President’s job has faded. It occurred to me that, rather than having all laws automatically sunset after a period of time, they could become eligible for removal after that period of time, but that an elected official would be responsible for going through the laws and choosing which haven’t done what they set out to do. It should be an official whose popularity then hinges on what they repeal, rather than what they enact. The Vice President might make a good choice for that position, as the Vice President doesn’t actually have much in the way of official responsibilities. Ties in the Senate are pretty rare and while the Vice President can preside over the Senate, there’s not actually a lot of responsibility there. The Vice President’s arguably most critical duty, the 25th amendment power to get the cabinet together and declare the President “unable to discharge the powers and duties of his office” is one that so far has never been invoked. A Law1 becomes eligible for repeal by the Vice President seven years after it becomes a Law or after two thirds of the State Legislatures petition the Vice President for repeal of the Law. The Vice President must report these Laws to Congress and the States. Congress may, within sixty days, block repeal with a two-thirds vote in each House. Alternatively, two-thirds of State Legislatures can vote to block repeal within 120 days. If repeal is not blocked by Congress or by the several States, the Law is repealed 120 days after the Vice President reports its repeal. This provision does not apply to Laws whose sole purpose is the repeal another Law. Congress would of course be free to re-pass the law, but this would open the law up for debate again, and there would be a better chance of learning from the failure of the first go-round. It is a lot easier to acknowledge the need for change once the original is gone. It would also make Vice Presidential debates a whole lot more interesting. In response to Essential Revolution: The Return of the Republicans: The crime of the day is when you do it again. I’m making the assumption here that Laws as referenced in the constitution are those Bills that have become Laws. It’s important that only full laws as passed by congress be repealable. Piecemeal repeal would be more complex, and the proposal here is to reduce complexity. So if there exists a more precise term of art, such as Act or Bill, it should be used; but I couldn’t find one. The eleventh through twenty-second amendments to the United States Constitution. Article One of the U.S. Constitution sets up the Congress, how to elect them, and the duties of the Senate and House of Representatives. We’ve got to protect our phony-baloney jobs. Despite their complaints about Trump’s overreach, Democrats have introduced legislation to make it harder for them to block his administration’s regulations. In 1922, following the first world war, G.K. Chesterton discovered to his dismay that the evils of the scientifically-managed state had not been killed by its application in Prussia. Unfortunately, it was also not killed by its applications in Nazi Germany. Asset forfeiture and traffic laws have one dangerous thing in common: they turn danger into a profit center for government. “If we can put a moon on the man, why cannot we devise a system whereby every state is billed by DC annually, and let the states compete for citizens to pay the taxes?” Moving from a system where the federal government taxes individuals to one where the federal government taxes state governments makes all of our lives a lot simpler and solves a lot of thorny civil rights issues as well. If reform conservatism needs an anticorruption agenda, what structural changes should be on that agenda? What would happen if our representatives actually read bills before voting on them? It can’t stop what it’s meant to stop. It’s filled our land with vice and crime. The Sunset of the Vice President last modified December 13th, 2015.